Okay, let's be honest. How many of us remember the date on which the insurance papers of our two-wheeler expires? Scratching your head to try and remember? A majority of Indians do not remember to renew their vehicles' insurance on time, while there's almost an equal number of people who think annual insurance renewal is a problem. A recent survey by Bharti AXA General Insurance reveals that 66 per cent of two-wheeler users fall in the above-mentioned categories. 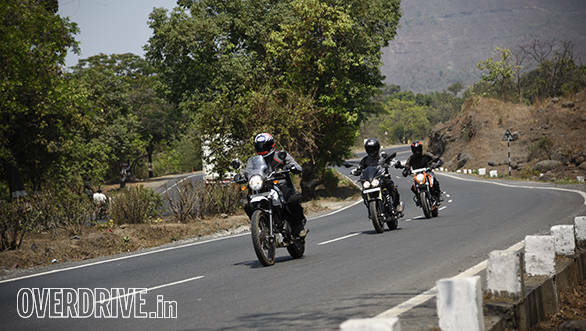 Another alarming figure that the survey indicates is that 75 per cent of the two-wheeler owners ride without insurance. Now, if you consider the millions of two-wheelers that dot our roads, you don't have to be a rocket scientist to understand that a major chunk of these riders run the risk of not having any insurance policy to cover for damages in case of an accident. Some of them only realise that their insurance policy has lapsed when they meet with an accident or are caught by cops. The survey was conducted on Bharti AXA General Insurance's Facebook page which has 6,35,156 followers, aged 35 years and below. The questions that were asked tried to determine why people did not renew insurance and whether a long-term insurance plan is an ideal solution. The poll was conducted over a week and there were over 100 responses. What people don't realise is that the perils of riding a two-wheeler in India are omnipresent. Accidents occur, either due to the rider's fault or by other road users. Whatever may be the case, two-wheeler riders suffer the most. 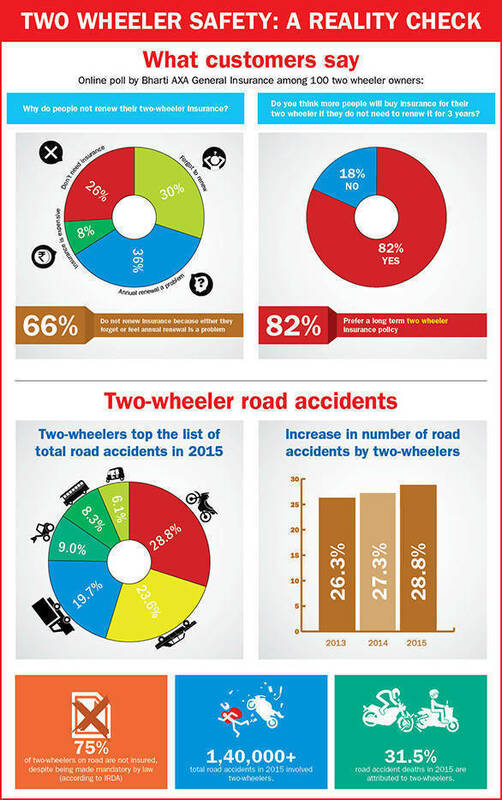 In 2015, of the total number of accidents that occurred in India, 28.8 per cent of them involved two-wheelers. That means over 1,40,000 accidents in 2015 involved two-wheelers. And mind you these indicate the reported cases. The number could be significantly higher if you consider the ones that aren't reported. What's also apparent is that there is a steady rise in the number of two-wheeler accidents over the years. This could be attributed to the rising number of two-wheeler riders, their relative inexperience in handling a two-wheeler and increase in congestion on our roads. So how is Bharti AXA General Insurance ensuring that there's a change in perception regarding insurance? The company is of the opinion that the one of the reasons behind the dismal number of valid insurance holders is the lack of awareness about the pitfalls of not having one. The second reason is that most people feel that the process of renewing insurance is too complicated. To address this issue, the company has taken steps to make insurance simple to understand, buy and claim. They also run Facebook and Twitter campaigns to spread awareness. In addition, the company also publishes articles in both English and vernacular media to reach a wide and diverse set of people across the nation. Their recent campaign, No more U-turns, focuses on general habit of two-wheeler riders who try to run away upon sighting a traffic cop, simply because they are unsure if their papers are valid. The company feels that its long-term insurance plans, going up to three years, saves people the hassle of renewing insurance every year. They are also using social media to promote adoption of long-term insurance policies. In 2016, the company issued 20.50 lakh policies, which is a good beginning. Think of insurance as a lifeline. In case you have the misfortune of meeting with an accident, insurance will save you from taking a big hit on your savings when you take your two-wheeler to the repair shop. Ensure you have a valid insurance and may we suggest you take a look at your existing policy, now.